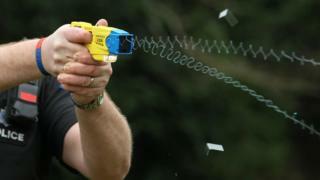 A further 100 police officers are to be trained to use Tasers, North Wales Police has said. It will take the number of officers who can use the devices to 400, but the force said having one can be enough to diffuse a situation. It follows a call last year for the majority of frontline staff to be armed with the devices after a rise in attacks across the area. The move has been welcomed by the North Wales Police Federation. "The police force expects officers to get involved in dangerous situations every single day to protect the public therefore it is only right and proper that officers are given the tools for the job," said Mark Jones, the federation's general secretary. When can the police use a Taser? "The police federation believes that every police officer who wishes to be equipped with a Taser should be afforded that opportunity." Training for the extra officers and buying 200 new devices will cost £136,000 and has been funded by the police and crime commissioner. Ch Con Carl Foulkes said: "It is often the case that just having a Taser officer present can diffuse a threatening situation without them actually having to use it or get involved in a physical confrontation. "The use of Taser means my officers will be better equipped to protect the public and themselves while also removing pressure from our firearms officers and ensuring we can respond more quickly and effectively with the appropriate resources." Tasers fire two small dart-like electrodes before delivering a high-voltage shock to temporarily disable a suspect. They were first used by police forces in England and Wales in 2003, and have become linked to a number of deaths. Last year South Wales Chief Constable Matt Jukes said all frontline officers in the force could be armed with Tasers to face the increasing threat of gangs carrying knives. Gwent Police said it was considering training more officers to use the devices.